Coldplay is set to rock the stage at Levi's Stadium in Santa Clara Wednesday night, but the community is wondering just how long they will play for. Kris Sanchez reports. Coldplay is set to rock the stage at Levi's Stadium in Santa Clara Wednesday night, but the community is wondering just how long they will play for. City officials recently stated that the popular group will be held to a 10 p.m. curfew, representing the latest move in the ongoing tug of war between the stadium authority and the city over weeknight concert curfews. Despite the curfew, Coldplay is expected to play past it, and the stadium authority will allow it. The vice president of the stadium authority sent a letter to the interim city manager indicating that shutting down the concert right at 10 p.m. could pose a public safety threat. A fine is on the table if the show goes late. Whatever that amount would be is small in comparison to what the stadium authority claims will end up costing the venue if weeknight concerts come to an end. Grammy winner Ed Sheeran recently canceled his scheduled tour stop at Levi's because of the curfew. The 49ers say the city loses out on $800,000 in revenue when an artist cancels or passes on a potential Levi's Stadium date. Santa Clara city officials want to conduct a community outreach program to hear what residents want city officials to do regarding this ongoing battle. That process is still in the planning stages. The 49ers on Thursday indicated that the team would be pulling the plug on weeknight concerts following Coldplay's performance. The team had asked to extend the curfew by one hour, but city leaders denied that request. 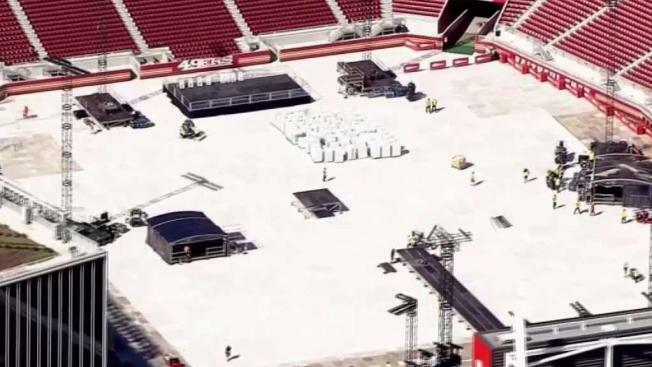 The team wanted a few exceptions a year, but on Thursday, 49ers officials wrote that they'll stop scheduling weeknight concerts because performers don't usually end by 10 p.m.
NBC Bay Area's Stephen Ellison and Ian Cull contributed to this report.